Refurbished, this is at the top of London’s great dining venues. : Restaurant Gordon Ramsay’s updated look is glamorous to a degree with its lilac, black and cream leather chairs and the crispest of crisp white linen. 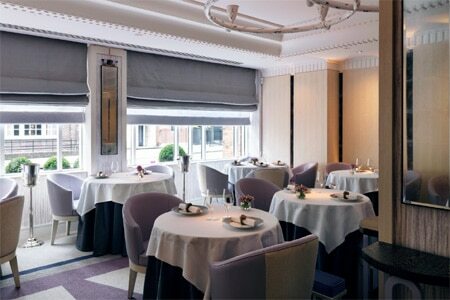 Discreet, elegant and stylish, the décor suits the accomplished cooking of Clare Smyth. Booking here has become even harder, but persistence pays off; this is a dining experience you’ll savor. Smyth has settled seamlessly into her role and produces sublime flavors. A ravioli of lobster, langoustine and salmon comes poached in a light bisque with a smooth caviar and sorrel velouté; foie gras and smoked confit duck is gutsy with pepper, pickled pear and pain d’epices. Mains might be Scottish halibut with crab, cauliflower couscous, lime and Moroccan spiced broth, or Scottish venison with truffle braised celery, roast apples and smoked ham. This is adventurous cooking that succeeds beyond all expectations. And desserts, while less overtly adventurous, have those touches that make them stand out. Try blackcurrant, fennel and yogurt sponge cake with a delicate violet sorbet, or the bitter chocolate cylinder with coffee granité and a ginger mousse. The wine list offers rare Burgundies and a collection of Hermitage you’d find difficult to come across in France. All this comes at a price, though the 3-course set lunch for £65 offers one of London’s great treats. À la carte 3-course meal £110; 7-course menu £145; 7-course seasonal menu £175.